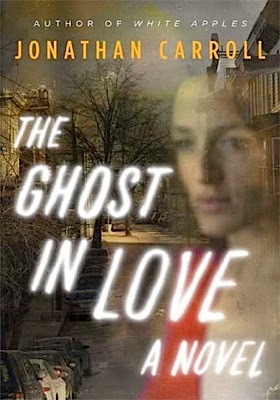 I believe that this book, The Ghost in Love by Jonathan Carroll, made it on to my TBR years ago after a rave review from Lena (who I don't believe is blogging anywhere at the moment). I guess I never picked it up in the interim because I had forgotten exactly what it was about. It turns out that it's about many things and it's hard to describe but believe me when I say that its uniqueness makes it fresh and thought-provoking and beautiful, all in an unusual way -- because this is definitely a strange book and it's not ashamed to be that at all. This story has a ghost and the man whose ghost she is, and a dog (of sorts), and an ex-girlfriend and a complete stranger, and angels and many other characters that come together in an ensemble that causes one to reflect on the tenuous border between life and death, the essence of each of our beings and the things that allow us to love each other past all our faults and flaws. 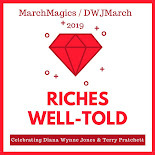 I'm very excited to explore more of Jonathan Carroll's work and, as Chris has highly recommended The Land of Laughs, it will be my next read of his -- and I promise that it won't take me years to get to it. You know, I read two of Jonathan Carroll's books a few years ago, and I just hated them. They made me feel exhausted and frustrated. I can't remember why, now! I should give him another try -- lots of people whose taste I respect have recommended him, including you and Neil Gaiman. I have this. If I manage to ever read it, it will definitely fit the long-awaited category! I remember a time before blogging when I would buy a book at the time I wanted to read it. Now books sit on my shelves for years and I forget why I even wanted to read them. This is one of the downsides of being in such an active book community! I've seen this around but never thought to pick it up. I may wait and read this one for the RIP Challenge. I had it on my RIP possibles list the last two years. :) It's pretty short actually so it would be a good one to just fit in sometime! Wow, this sounds like an interesting read. I don't think I'd ever heard of it, but it is definitely on my list now. "Mentally invigorating" - now that's an endorsement! It's definitely one of those books that's hard to describe because it's so non-traditional. I hope I did it justice and that it gets some new fans!